I can’t look at the Yoga Tarot cards without thinking in terms of the chakras — and today, here come two cards with beautiful blues and greens. The colors on these cards look like Earth, from a distance! 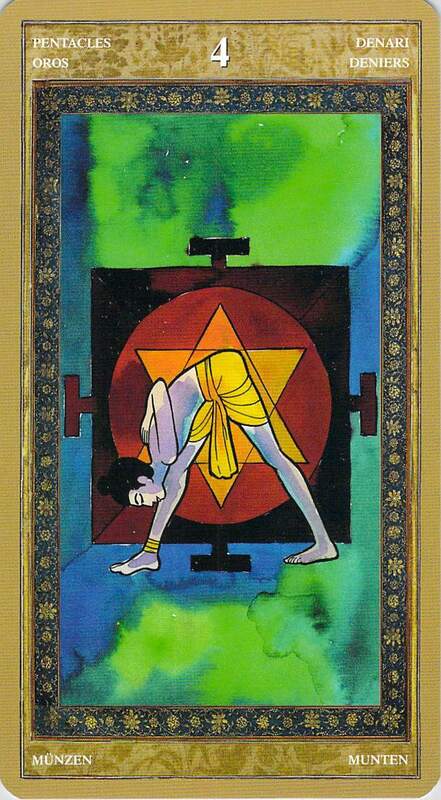 Yet these cards are both from the suit of pentacles, a suit that speaks to us of root and sacral chakra issues: safety, security, family, physical health. 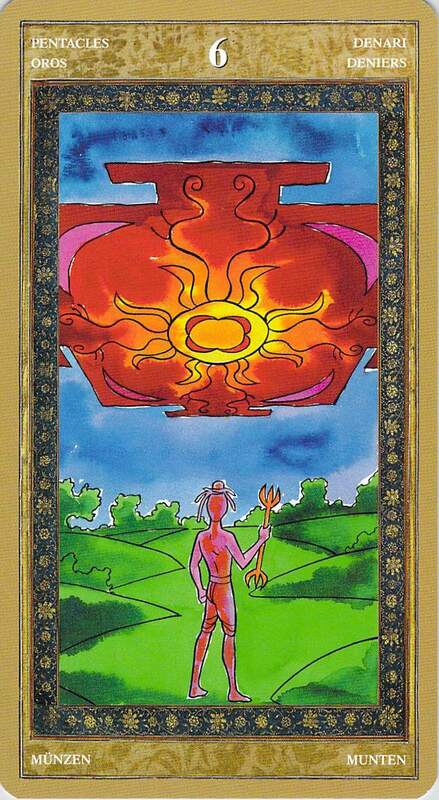 And those lower chakra reds and oranges are present in these cards as well. I think what I’m seeing here is a message to advocate on behalf of our physical health and material well being today, using truth and sincerity. For some of us this may mean going to a doctor and confiding in someone about those mysterious symptoms that have been worrying us. For others, it might mean picking up the phone to negotiate with bill collectors or going out and sincerely looking for work, using one’s voice. For some, it might mean confiding in a friend or other trusted person about feelings of depression, or about being a survivor of abuse, or about some other concern that deeply affects us at a very basic, primal level. It might mean being a whistleblower. Or it might mean something as simple as stating one’s honest opinion rather than swallowing it. In fact, if you start to think about it, there are many, many situations in which just talking to another person about a serious concern — getting something off one’s chest — can bring the beginning of deep mental, emotional and even spiritual healing. But most of all, I think these cards remind us that our spiritual well-being affects our physical well-being and our material abundance. So even if we think we see a path to security that involves falsehood or deception or maybe just the simple self-deception of trying to be someone we are not — we’re asked to remember that paths not based on truth and sincerity are not as secure as they look. A path that might look riskier is likely going to turn out to be safer in the long run, if it’s the path that involves being who you truly are, acting with integrity, and speaking from the heart. Not just spiritually safer, but physically safer, and safer in terms of doing a better job of keeping a roof over our heads and food in our bellies. We can’t always tease out the connections between ethical integrity and material abundance, and it’s especially hard when we choose an ethical path that doesn’t bring much material wealth. That’s when people start thinking that ethics come at a high price. But that’s not true. It’s just that we don’t always recognize the things we have for what they are, and we don’t always recognize that the hardships in life are the experiences that help us to become who we truly are. Without experiencing hardship, ever, who would we be? And without who we are, who is left to appreciate material wealth and/or good health anyway?